A detailed understanding of the structure and function of Photosystem II (PSII) which is responsible for the light-induced oxidation of water to O2, remains elusive despite the intense scrutiny to which this protein complex has been subjected. 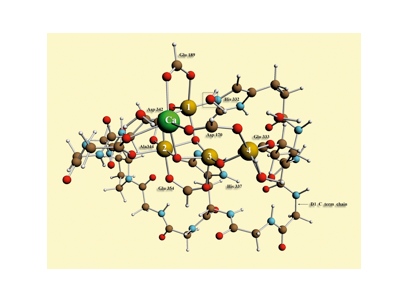 At the heart of this system is a metal active site which contains four Mn and one Ca atom. 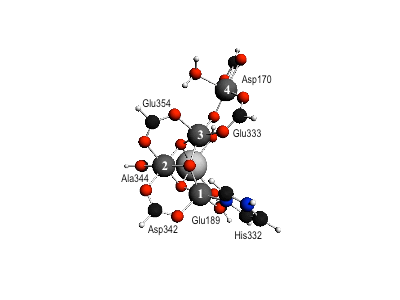 We are using computational chemistry to build up a structural model of the Mn4/Ca cluster in all its catalytically relevant oxidation states in order to reconcile the very different arrangements of the Mn atoms in the PSII core seen in the X-ray crystal structures, and also to rationalize data obtained from recent spectroscopic and water substrate binding studies. This model structure will have important implications as to the mechanism of water oxidation in PSII and will guide subsequent studies in the design of systems capable of artificial photosynthesis. Calculated structure of the Mn4Ca cluster responsible for water oxidation in PSII highlighting the μ3-O bridge connecting Mn, Mn and Mn. Calculated structure of the Mn4Ca in PSII which includes the protein straps (comprising a segment of the D1 terminal peptide from His332 to Ala344) connecting the four Mn centres.